Growing up in Townsville, QLD, Kym has been teaching Dance since 1998 and has a Bachelor of Journalism, Bachelor of Arts and a Graduate Diploma in Secondary Education specialising in Dance. She holds her Australasian Dance Association (formerly FATD) Advanced Teachers Tap and Elementary Teachers Modern certificates. In 2008-2009, Kym was the Principal Tap, Jazz & Hip Hop teacher at Glenda Allen Dance Academy in Hong Kong and in 2010 she moved to Canberra to be Principal instructor at another local dance studio. Many of Kym's former students have continued on to dance professionally in Australia and overseas. In 2011, Kym was the Arts Education tutor for Dance at the University of Canberra. She was the Head of Dance at Calwell High School (2012-2015) & at the time, ran Canberra's largest High School Dance program. In 2016, she began teaching Dance, PE & Art at Namadgi School & now teaches Dance to all Namadgi students from primary school -Year 10. Kym is Vice President of Ausdance ACT and has been a Board member since 2014. Kym’s industry contacts are extensive as she has had a 10 year international professional dance career, most notably as a Cancan dancer at the Moulin Rouge in Paris from 2004-2006. Another career highlight was being Principal dancer and Dance Captain for Dance Encore Productions at Zenboo in Tokyo from 2007-2008. She has also lived and danced in shows in Hong Kong, Wakura Onsen (Japan) and Sydney and toured to Rome with the Moulin Rouge, USA with Australian Dance Ensemble and Edinburgh with Extensions Youth Contemporary Company. Kym has extensive promotions and modelling experience which includes shows for Coca-Cola, Hottie, Sydney Bridal Expo, Xbox, Loloma Jewelers, Fashion TV Model Awards (Paris) and Fashion Hall-of-Fame designer, Richard De Chazal. Aside from performing, Kym was a writer for the Australian Dance teacher magazine & an Arts critic for the Townsville Bulletin and in 2019 published her first book, Frou Frou to Fruition. Her book uses examples from her experiences to assist dance, dance teachers and studio owners find success in the industry. Kym has appeared in a number of TV shows, most notably as a host and translator for Japanese reality show, Ainori during its Australian tour and in the Fox mini-series, Secret City. She also performed on The Train of Desire (Rome) and with Penelope Cruz on France’s Hit Machine. Kym has a certificate in Event Management & worked as an assistant at The Special Event Factory working behind the scenes for clients who included Guy Sebastian, Shannon Noll and the The North Queensland Toyota Cowboys (NRL). While Kym enjoys teaching all styles of dance to the young and old, she has a particular passion for sharing her expertise in tap and cabaret. She also specialises in teaching boys to dance and has had great success running Boys Dance programs in Queensland and the A.C.T. Kim started singing from birth and dancing at age 4. During high school she developed a love of musical theatre, performing in supporting and lead roles from year 8. This passion continued to community theatre groups all over Sydney. Some of her favourite roles include "Ellie Greenwich" in 'Leader of the Pack; "Irene Molloy" in 'Hello Dolly'; "Grace Farrell" in 'Annie'; "Ado Annie" in 'Oklahoma'; "Hodel" in 'Fiddler on the Roof'; "Lucy Van Pelt" in 'You're a Good Man, Charlie Brown'; and "Crystal" in 'Little Shop of Horrors'. Kim has trained vocally with Diane Donovan and trained in Opera with Anthony Winter. Professionally, Kim performed as a backing vocalist/dancer for Dance Encore Productions 'Elvis Come Back Tour' in Japan. 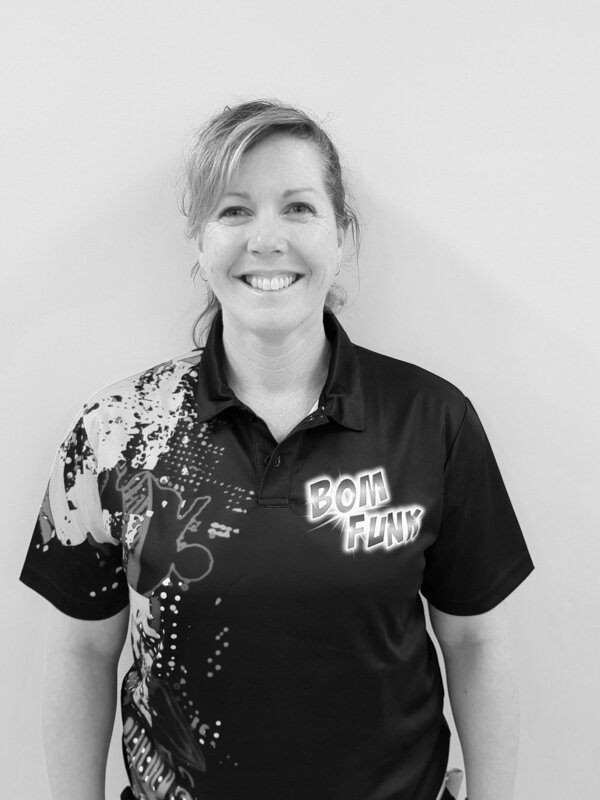 Currently, Kim is a senior member of Tap Kix - Canberra's only Pro/am Tap Group and teaches Adult Beginner Cabaret class at Bom Funk Dance Studio. Michelle holds a Bachelor of Science and a Graduate Diploma in Education (Secondary) and has completed her Tap BAL teacher’s exam. She has been a Secondary School Teacher since 2001 and has taught Dance in high schools for most of those years. She was the Head of Dance at Calwell High School for 5 years and Acting Executive of the Arts Faculty for part of this time. She then taught Dance at Namadgi School before taking up the position of head of the Talented Dance Program at Erindale College in 2019. Michelle has choreographed and work-shopped more routines than she can possibly remember and has had students perform in many events across the ACT and NSW including Rock Eisteddfod, the Youth Dance Festival and Limelight. Several of her students have continued on to have successful Dance careers of their own, attending places like The Australian Ballet School & WAAPA. Outside of high school, Michelle has taught Dance in studios across Canberra since 1999 and specialises in Tap and Tiny tots. Michelle works as a classroom teacher in ACT government schools. She is Registered through the Teacher Quality Institute (TQI). Michelle has always been passionate about Dance, starting as an enthusiastic kid doing a range of styles and gymnastics. She then found her true love in Latin dancing. She was awarded the DanceSport Australia Medal tests completed the highest levels in New Vogue, Ballroom and Latin. Following this she began teaching and competing. She went on to train in Sydney and then Sweden. Michelle competed throughout Australia dancing the highest open level. One of her biggest achievements was winning the Adult Queensland Latin American Open. Michelle has been regularly hired around the state to perform in numerous styles for a range of events. She has a Bachelor of Education and a Graduate Certificate in Educational Leadership with Dance and Physical Education being her major electives. (Australian Catholic University and University of Canberra). She has taught Dance in Public and Private ACT Schools to students Primary, Secondary and College level and was on the team to write the Board of Senior Secondary Studies Tertiary and Accredited Dance Courses. Michelle has entered students in Dance Festival through AusDance and has choreographed and trained students for school musicals. She has also choreographed for other independent dance concerts and been hired to choreograph content for dance schools in Canberra. Michelle has her Certificate IV in Training and Assessment (Canberra Institute of Technology and RGT and Forensic) and has internationally recognised qualifications in Aerial fitness and dance through the Elevated Training Group. She shares her love of Dance and fitness through teaching and she is heavily involved in the industry by continuously learning from other dance/ fitness/ gymnastics professionals. Jaimee grew up around dance, and cannot remember a time when it wasn’t part of her life. She began at the age of three and followed in her mum’s footsteps with tap and jazz classes, which she continues to this day. As she grew older so did her craving to learn more and at the age of thirteen she began contemporary, lyrical and hip hop. Since then, Jaimee has gone on to be a part of several Hip Hop crews in Canberra and Sydney and has even been lucky enough to represent Australia with two of these crews at the World Hip Hop Championships in Las Vegas. At eighteen years old she moved to Sydney and attended a full time performing arts school where she graduated with a Diploma in Dance. During her time in Sydney she had the chance to work with many wonderful people including, Talia Fowler, Stephen Tannos, Mathew Gode, Marko Panzic and many more. This led to some great performance opportunities such as music videos, live events and even a Bollywood film. Jaimee has been lucky enough to have had some amazing experiences through her love of dance and is excited to start the next chapter as part of the Bom Funk team. Brooke has been studying dance since the age of 3, studying and performing across all styles. Brooke completed exams under ATOD, RAD and Glen Wood Tap syllabi throughout her training. In 2016 Brooke completed her studies at Jason Coleman's Ministry of Dance with a Cert 4 in Dance, Cert 4 in Dance Teaching and Management and Diploma in Elite Dance Performance. Hannah moved to Canberra from Queensland where she has danced for the past 20 years, specialising in Song & Dance, Ballet, Jazz, Contemporary & Lyrical styles. She has competed in local and regional Eisteddfods and championships since the age of 6. Hannah has completed her Australasian Dance Association (formally FATD) Jazz/Modern exams up to Bar to Gold Star, receiving top marks. She also completed ballet training up to RAD Advanced 2 level. She travelled through Regional Queensland with the Queensland Ballet Educational Program in 2007. Hannah taught Song & Dance at Ann Roberts School of Dancing for 8 years and built the program from approximately 20 students to over 80 students over this time. Hannah has been a member of Extensions Youth Dance Company from 2003-2014. For 3 years Hannah has co-directed programs for Extensions, as well as taught and choreographed contemporary and lyrical classes and performances for the company. Many dancers who have trained with Extensions have moved onto professional dance careers either with professional contemporary company, Dance North or with interstate and overseas companies. Through Extensions, she has travelled to many Youth Dance Festivals including Melbourne and Horsham. Hannah has trained in silks and circus skills through LaLuna Youth Arts. She danced professionally as a cheerleader for 4 seasons of the NBL (National Basketball League) for the Townsville Crocodiles. Hannah has performed in numerous musicals with Queensland theatre companies including, Chicago, Hairspray, Chess, Cats, Oliver, The King and I, Spamalot, Fiddler on the Roof, Joseph and his Technicolour Dream Coat, and Beauty and the Beast. Her favourite role to date was Victoria in Cats. Bom Funk studio owner, Kym Degenhart taught Hannah dance for several years in Townsville, also working alongside Hannah’s mother, teaching Song & Dance classes. Kym is thrilled to have Hannah join the Bom Funk Faculty. 2017 will be Hannah's third year teaching at Bom Funk. the Year, a highly prestigious and sort-after award in the Calisthenics community. Calisthenics is an all-round dance sport with a focus on strength and flexibility. To attain and keep a level one coaching qualification, Grace has completed courses on how to teach strength and flexibility to all ages and levels. She continues active professional development in this area. Grace is currently at university studying Psychology. She loves teaching dance and looks forward to teaching at Bom Funk for her forth year in 2017. Maddison has been dancing since the age of 4. She has trained in a range of styles including Tap, Jazz, Hip hop, Contemporary and Ballet. For the past 4 years, Maddie has choreographed and performed in a number of events including Australian Dance Crew Championships, Champion’s Tour, Limelight, Rock Eisteddfod and the Canberra Youth Dance Festival (‘Lest We Forget’ nominated for Australia Dance Awards Outstanding Achievement in Youth or Community Dance in 2012). She represented Calwell High School and the Canberra region at the World Supremacy Battlegrounds, an International Hip hop competition held in Sydney in 2012 & 2013, placing 3rd and 1st respectively in the High School division. She was a member of Bom Funk Mega Crew in 2014 placing 1st in the Canberra division of Battlegrounds and Highly Commended in the Brindabella Open Hip Hop. Maddie has choreographed and taught routines to Calwell Primary students for their annual ‘end of year’ concert and has been involved in numerous other events around Canberra including dancing at Spin for Canberra Centenary celebrations and at Floriade. She was awarded the CHS Most Outstanding Performer Award in 2013. Maddie was a member of the Tap group, Tap Kix, a local group who joined Bom Funk Dance Studio in 2014. She studied choreography for 3 years and completed her teacher training under the watchful eyes of Kym Degenhart, Michelle Skerry-Wallace and Ellouise Carr. Maddie was lead teacher for JPod Crew & Gems Troupe who placed in numerous competitions and received the International Dance Teachers Association diamond for the overall Most Entertaining Group at Showcase Dance Championships (2016) as well as the 'Fierce & Fabulous' Award at Kids Artistic Revue (2016). Maddie joined the Bom Funk faculty in 2014 & looks forward to another year teaching while also pursuing Education at University. Ashleigh has been studying dance in the styles of Jazz, Broadway Jazz, Hip Hop, Cabaret, and Tap since the age of two. She has been involved in a wide variety of competitions and performances including STOMP Ball, JDRF Fun Run and various outdoor public performances. Ashleigh has been a member of Bom Funk Performance Squads for many years including NRJ, High Kix Diamonds, High Kix Cabaret and Tap Kix. She has enjoyed opportunities to learn from guest choreographers including Jesse Rasmussen, Joel Rasmussen, Stephen Tannos, and Dylan Mahoney. Ashleigh has also assisted Binalong Public School for their end of year performance of The Wizard of Oz. fun dance activities for her students. She is currently studying Primary Education at ACU. Celina loves to spend more time on her hands than on her feet! She began gymnastics at 2 years of age and continued to train and compete for the next 12 years. She has represented ACT, NSW and Australia in local and overseas gymnastics competitions. Her biggest achievement was placing 1st on vault in Hawaii. During her last year of gymnastics She started dancing at Bom Funk to help improve her dance elements in gymnastics and has since fallen in love with dance. Celina has taken part in two dance tours around Los Angeles USA and Hong Kong. During these tours she performed at places such as Disneyland (USA & HK), Disneyland main street parade; Universal Studios, Ocean Park and Hollywood Boulevard. She is an original member of High Kix Cabaret and loves to share a good laugh with her class mates. Celina received the Studio Spirit Award and Community Spirit Award in 2016. In July 2018, Celina was cast in the Qantas “ Stand Up For The Spirit Of Australia” commercial featuring Hugh Jackman. Celina is a qualified Acrobatic Arts teacher and is always up for a handstand competition. She loves new challenges, which involve balancing on her hands. Adriana has had a passion for teaching and the performing arts since she was a little girl. She started dancing at the age of 6 at Dance City and then joined the Bom Funk family in 2015. Adriana has also had 9 years of vocal training. Since being at Bom Funk, Adriana has been trained in Hip Hop, Tap, Musical Theatre and Song and Dance. Adriana joined the Bom Funk faculty in 2019. She is currently co-teaching ‘Intermediate Song and Dance’ with Miss Kate and operating the boutique on Saturday mornings. In 2018, Adriana graduated from St Clare’s College. She majored in dance, drama and childcare; and received her Certificate III in ‘Early Education and Care Settings’ which was in coherence with CIT. During her schooling she graduated with a ‘Dedication to Dance Studies Award’, performed in Ausdance DanceFest 2017-2018 and Cabarets, and has been leads and chorus members in school musical productions (Policeman in Pirates of Penzance, Damage control Crew in Return to the Forbidden Planet, Martha Cox in High School Musical and Kathy in Disco Inferno). Currently, Adriana is studying her Diploma in ‘Early Education and Care’ at CIT whilst working at an Early Learning Service in Jerrabomberra to broaden her understanding of working with children, families and educators and put it into practice. Adriana believes that teaching is such a rewarding job. She is very excited for this year ahead and can’t wait to see her very talent popstars evolve. Kate has been dancing for as long as she can remember and has trained in various styles including Jazz, Ballet, contemporary, Cabaret, Musical theatre and many more. She is currently completing a certificate III in dance and a certificate III in musical and stage performance. She is proud member of Diamonds and High Kix and loves performing with her Bom Funk Family, the most memorable being the end of year concert ‘Over The Rainbow’ when she played the role of Dorothy. Kate started as a student teacher in 2017 before becoming an assistant teacher in 2018. This year Kate will be teaching classes in the styles of Jazz, Song and Dance and All Starz as well as our Dance Kingdom program. Carol is a dancer/teacher from Canberra and has been dancing for 13 years and has trained in numerous styles including contemporary, jazz, tap, lyrical and her favourite style, hip hop. She started hip hop dancing in 2015 at Bom Funk Dance Studio and commenced teaching there in 2017. Carol has competed in numerous competitions since she was young and still enjoys competing to this day. Carol has performed at many events such as a The Australian Dance Championships, Battlegrounds, Floriade, school fetes and Ausdance Youth Dance Festival. She has taken workshops with Joel Rasmussen, Dylan Mahoney, Alexandra Carson and Parris Goebel. Carol had received the all-star hip hop trophy at the 2016 Bom Funk end of year Showcase for her efforts in the hip hop dance genre. Carol had received 1st overall in her entire age group 16-19yrs soloists at the KAR dance competition in 2018. Keely has been dancing with Bom Funk since she was nine. Over her time she has trained in a range of styles including Hip Hop, Lyrical/ Contemporary, Ballet, Tap, Jazz, Broadway Jazz and Musical Theatre. She is currently focusing on Tap, Hip Hop and Broadway Jazz and is a current member of High Kix Cabaret and Tap Kix. Keely has performed at a range of festivals and competitions including Art not Apart, STOMP Ball and Worlds Supremacy Battlegrounds. Over her years at Bom Funk she has won the Tap all-star award, Choreographer all-star award and most promising junior female student. Keely enjoys being active and social with her peers and takes a professional approach to all of her classes. Keely is currently studying the International Baccalaureate Diploma Program at Canberra Grammar School. Ellouise has been teaching Ballet and Contemporary/Lyrical dance since 2000. She taught RAD ballet for 12 years at Wendy Gibbs School of Ballet in Caringbah, NSW where her students received excellent results in examinations and competitions; were selected for the Australian Ballet School Interstate Program, NSW Dance Ensemble, Scholarship Program MacDonald College and Newtown School for Performing Arts; accepted to study prestigious fulltime and tertiary courses at The Australian Ballet School, The Royal Ballet School, Ev&Bow and UNSW Dance Studies. Many of her former students have gone onto professional careers with both Australian and International dance companies. Ellouise has a Graduate Diploma in Education (Secondary) and taught Dance at Calwell High School 2012- 2015. For part of 2014 she was Acting Executive of the Arts Faculty, organsing and running many Arts & Dance events for the school. She also holds a Bachelor of Design (Hons) with a Minor in Costume and Theatre design and has designed and made costumes for many troupes, solos and eisteddfod performances. In 2016, Ellouise took up a prestigious teaching position with Monte Sant' Angelo Mercy College in Sydney. She remain as Assistant Director of Bom Funk and takes guest classes and workshops throughout the year, travelling between Sydney and Canberra when necessary. Ellouise devotes much of her time behind-the-scenes to Bom Funk's design tasks and also assists with administrate duties for the studio. Adam has extensive experience as an event manager working with Cats Eyes in Paris and The Special Event Factory in Australia. Adam was primary liaison for the company’s major client, The North Queensland Toyota Cowboys (NRL). In this role, Adam assisted in presenting game-day entertainment packages of a national standard to be presented on Fox Sports. Adam was also the Stage Manager for artists such as Guy Sebastian, Shannon Noll, Marcia Hines, Killing Heidi, Glen Shorrick, Lee Kernigan and The Whitlams. Adam currently works as a Trade Mark Examiner at IP Australia. He holds a Bachelor of Arts (Hons) and a Graduate Diploma in Secondary Education. He was awarded the University Medal at University of New England in 2011. Adam and Kym have been travelling the world together since 2004, before settling and marrying in Canberra in 2013. At Bom Funk Dance Studio we wish to encourage and nurture senior students who would like to consider a career in teaching dance and choreography. We are an affiliate partner studio with DANCEstep: Student Teacher Education Program and have incorporated this teacher training and mentoring program to allow our student teachers time in the classroom with qualified teachers so they can learn how to teach and correct students safely, instruct correct technique, learn how to develop dance curriculum, integrate progressions for differing abilities and to help support their creativity development. We're always on the lookout for passionate, energetic and experienced teachers to join our faculty. If you are interested in teaching, please email us your resume detailing your experience. We'd also love to hear from you in at least 250 words why you'd like to join our inspiring team of teachers.